1 of 4 Heat broiler. Cut steak into 1-inch cubes. Thread onto 4 metal skewers, dividing equally and alternating with pepper pieces. Stir together curry powder, 1/4 teaspoon of the salt, the pumpkin pie spice and pepper. 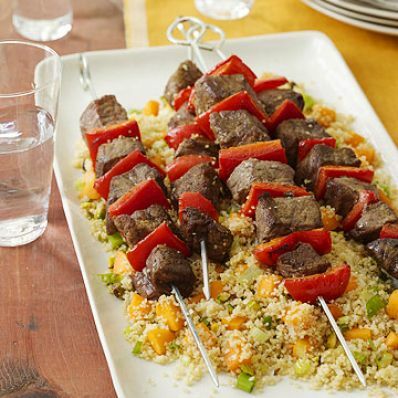 Sprinkle over skewers (all sides). Place on a broiler pan and set aside. 2 of 4 Bring 1-1/2 cups water, bouillon and remaining 1/8 teaspoon salt to a boil in a saucepan. Stir in couscous, scallions and apricots. Turn off heat and cover. Let stand 5 minutes. 3 of 4 Broil skewers, 2 inches from heat, 8 minutes. Turn once. 4 of 4 Fluff couscous and stir in pistachios. Spoon onto platter; top with skewers and serve.